Good morning fellow stampers. Beth Norman here with a Watercolor Distress card for you. You can find the Watercolor Distress technique in the February 2007 edition of the Technique Junkie Newsletter. 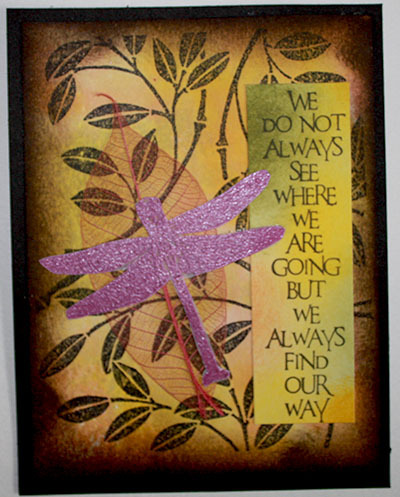 My Dragonfly, set of 2, was heat embossed using a purple/pink embossing powder and is overlapping a leaf. I love those leaves and am sorry we can't buy them any more. 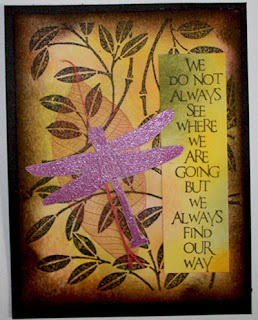 After distressing my background I stamped Curved Bamboo over top in black VersaFine and added Find Our Way sentiment. Edging was distressed with Distress Ink. Thanks for stopping by. Don't forget to come back to see what the rest of the design team has in store for you.